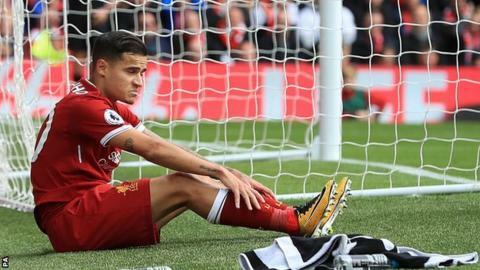 Liverpool boss Jurgen Klopp said he was "angry with the result but pleased with the performance" after Burnley frustrated his side on Philippe Coutinho's return to the starting line-up. The Reds racked up 35 efforts at goal to the Clarets' five, but could have lost had Joel Matip not cleared Ben Mee's header off the line late on. "It's our fault. We were dominant, fantastic attitude. We played good, were fluent with seven changes, but only one goal," added Klopp. "It's the best we have played against Burnley since I have been in. In the past we didn't feel good in the game. Today I saw fluid movements, passing between the lines, speed, crosses. "We have to take the point and carry on." Burnley went ahead through Scott Arfield's crisp finish on a rare foray forward in the 27th minute. Mohamed Salah swivelled to dispatch a shot past goalkeeper Nick Pope three minutes later, but the seemingly inevitable second never arrived for the hosts. Substitute Dominic Solanke's instinctive side-foot volley against the bar was as close as the Reds came, as Burnley enjoyed another fruitful away day after an opening-day victory at Chelsea and a draw against Tottenham. The suspension of Sadio Mane in the wake of his red card at Manchester City ushered in the return of Philippe Coutinho to Jurgen Klopp's starting line-up and the Brazilian seemed eager to show his commitment to the cause after an unsettled summer, featuring several offers from Barcelona. Afforded a deeper role behind the attacking trio of Roberto Firmino, Daniel Sturridge and Salah, he was as industrious as he was inventive. Only centre-back Ragnar Klaven recorded more touches than Coutinho despite the attacker being brought off with 11 minutes to go. Like his team though, his finishing was not good enough to convert pressure into a lead. Too often, Liverpool's shots were too wayward and from too far out. On an afternoon of deep frustration, Klopp may take solace from the performance of Salah, whose speed and direct running provided a contrasting threat to Coutinho's clever angles and probing passes. The Egyptian's return of five goals in eight games since signing from Roma in the summer could be even more impressive however - too often he found goalkeeper Pope rather than the back of the net when well placed. The suspicion is that Mane would not be found similarly wanting. Burnley won only seven of their 40 points last season away from Turf Moor. But they are only two away from matching that total after trips to Stamford Bridge, Wembley and Anfield in their opening three away fixtures of this campaign. Occasionally the visitors rode their luck. Mee could have seen a penalty awarded against him for a foul on Salah and 25-year-old Pope - excellent on his first Premier League start in place of the injured Tom Heaton - was helpless as Solanke hit the woodwork. But the Clarets' trademark organisation and concentration - embodying boss Sean Dyche's priorities- restricted Liverpool to efforts from distance for long periods. They are seventh, above today's opponents on goal difference, and can look forward to a more comfortable fight against relegation, at the very least, if they continue to prosper on the road. Burnley boss Dyche admitted after the match that he encouraged his team to play direct and test Liverpool's defence after seeing their discomfort in the air at times this season. A new centre-back combination of Klavan and Matip did little to solidify the Reds rearguard and Chris Wood's presence was enough to distract both in the lead-up to the opener. Mee came close with headers from successive corners in the final 10 minutes and the frustration from the stands in reaction was surely aimed, not just at today's performance, but at the club's failure to strengthen in that area over the summer. It is a failing that continues to undermine Liverpool's free-flowing attacking unit. Liverpool manager Jurgen Klopp: "When you have shots on goal it's not about their defending. Their keeper made a few outstanding saves. Philippe had a really good game. He had a little cramp at the end. We did not plan to take him off but we had to decide differently." Burnley manager Sean Dyche: "I'm not afraid to get the ball forward and I thought that was effective. Our shape was good and Popey was excellent in goal. "We know it's tough coming to these places and we are willing to do the bits that are nitty gritty in the game. Very few teams will come here and dominate, we knew we would have to do the basics. Now and again you need a bit of luck. "We are still learning a little bit, me included but I'm very pleased with today." Liverpool had 35 attempts on goal - since 2003-04, they've only had more in a single Premier League match once (37 in the 4-0 win over Everton in April 2016). Burnley have scored in consecutive league games at Anfield for the first time since August 1969. These were the first points Burnley earned in a league match at Anfield since a 1-0 win in September 1974 - they had lost their previous four in a row before today. Emre Can has provided as many assists in his four Premier League games this season as he had in his previous 89 combined in the competition (2). Liverpool have averaged 72% possession over their last three Premier League games against Burnley, but have only managed to win one of those games (D1 L1). Mohamed Salah is now Liverpool's top scorer in all competitions this season with five goals. Liverpool travel to Leicester in the League Cup on Tuesday before making the same trip in the Premier League on Saturday, 23 September. Burnley take on Championship high-flyers Leeds in the League Cup on Tuesday before welcoming Huddersfield to Turf Moor the following Saturday in the league. Match ends, Liverpool 1, Burnley 1. Second Half ends, Liverpool 1, Burnley 1. Attempt blocked. James Milner (Liverpool) right footed shot from the centre of the box is blocked. Assisted by Trent Alexander-Arnold with a cross. Corner, Liverpool. Conceded by Jack Cork. Attempt blocked. Emre Can (Liverpool) right footed shot from outside the box is blocked. Assisted by James Milner. Attempt missed. Emre Can (Liverpool) right footed shot from outside the box is close, but misses to the right. Assisted by Trent Alexander-Arnold. Attempt saved. Mohamed Salah (Liverpool) left footed shot from the right side of the box is saved in the centre of the goal. Assisted by Daniel Sturridge. Hand ball by Matthew Lowton (Burnley). Offside, Burnley. Stephen Ward tries a through ball, but Sam Vokes is caught offside. Dominic Solanke (Liverpool) hits the bar with a right footed shot from very close range. Assisted by Trent Alexander-Arnold. Attempt saved. Trent Alexander-Arnold (Liverpool) left footed shot from the centre of the box is saved in the bottom right corner. Assisted by James Milner with a cross. Attempt missed. Dominic Solanke (Liverpool) header from the centre of the box misses to the left. Assisted by Trent Alexander-Arnold with a cross. Attempt saved. Ben Mee (Burnley) header from the left side of the six yard box is saved in the bottom left corner. Assisted by Robbie Brady with a cross. Attempt blocked. Ben Mee (Burnley) header from the left side of the box is blocked. Assisted by Robbie Brady with a cross. Corner, Burnley. Conceded by Emre Can. Substitution, Liverpool. Alex Oxlade-Chamberlain replaces Roberto Firmino. Substitution, Liverpool. Dominic Solanke replaces Philippe Coutinho. Attempt missed. Philippe Coutinho (Liverpool) right footed shot from outside the box is too high. Assisted by Trent Alexander-Arnold. Attempt saved. Robbie Brady (Burnley) left footed shot from outside the box is saved in the top right corner. Assisted by Jack Cork. Corner, Liverpool. Conceded by Stephen Ward. Attempt blocked. Roberto Firmino (Liverpool) right footed shot from outside the box is blocked. Assisted by Daniel Sturridge. Attempt missed. Emre Can (Liverpool) header from the left side of the box is too high. Assisted by James Milner with a cross following a corner. Offside, Liverpool. Joel Matip tries a through ball, but Mohamed Salah is caught offside. Attempt blocked. James Milner (Liverpool) right footed shot from the right side of the box is blocked. Assisted by Daniel Sturridge.